The baby is now moving about vigorously and responds to touch and sound. A very loud noise close by may make it jump and kick. It is also swallowing small amounts of the amniotic fluid in which it is floating and passing tiny amounts of urine back into the fluid. Sometimes the baby may get hiccups and you can feel the jerk of each hiccup. The baby may also begin to follow a pattern for waking and sleeping. Very often this is a different pattern from yours, so when you go to bed at night, the baby wakes up and starts kicking. The baby’s heartbeat can now be heard through a stethoscope. You will be able to hear it by putting an ear to her abdomen, but it can be difficult to find the right place. in the amniotic fluid. 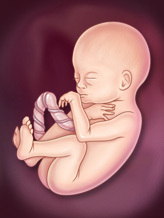 The vernix mostly disappears before the birth. At around 26 weeks the baby’s eyelids open for the first time. The eyes are almost always blue or dark blue. It is not until some weeks after birth that the eyes become the colour they will stay, although some babies do have brown eyes at birth.